New Book about John White! We had been meaning to put this announcement up for all to attend, but we understand that it sold out almost immediately. 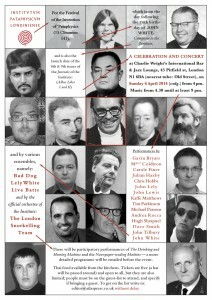 This is the launch of Dave Smith’s book, The A-Z of John White, sponsored by the Intitutuum Pataphysicum Londiniense, Sunday, 6 April, at Charlie Wright’s International Bar and Jazz Lounge, in London from 4 pm. 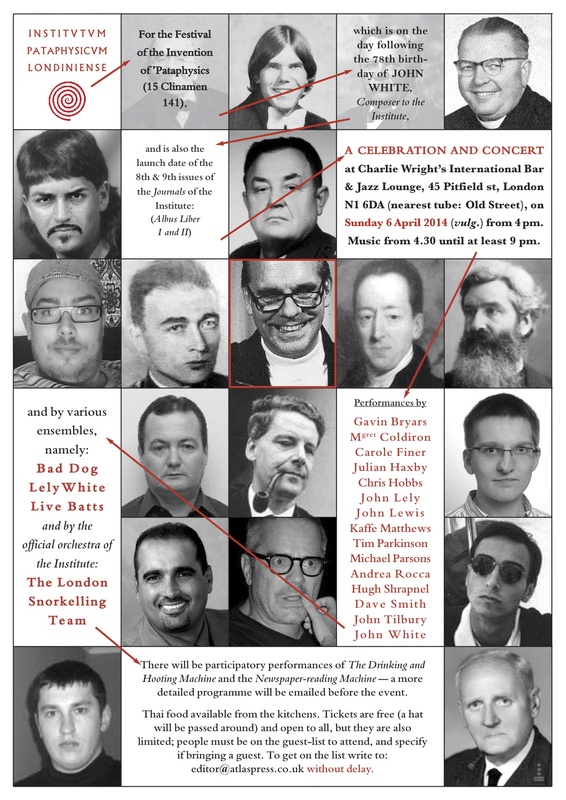 John White is also 78 years old this week, so the theme of the activities — a lot of performances! — is 78. White, who is pretty much the ‘Godfatha’ of British Minimalism, has created Machines, systems, electronic symphonies and his own diary-like series of piano sonatas (near 200 these days — it’s hard to keep up with him!) over the years, as well as founding some of the great British groups: the Promenade Theatre Orchestra, Hobbs-White Duo, The Garden Furniture Ensemble, Farewell Symphony Orchestra, Live Batts! !, among others. White’s music (as you might guess from the band titles) is inventive and delightful. Dave’s book is a compendium of all things White, including types of music, performances, and reviews. Important stuff. Here’s the announcement: we’ll let you know how to get the book and hopefully send news of what happened at this event next week. (the pictures are those of all sorts of guys named John White). The publication is called Albus Liber, Exploits & Opinions of John White, Composer. Please! Is possible to know where and when the book about John White will be available? Maybe thru EMC? – – – and it’s not very easy anyway. That website cannot lead me to any specific item concerning the new publication; not even to any specific method of getting in touch with the publisher(s) and ask for it . Help, anybody ? Hi Oded, we’re trying to work on getting this issue available. Hang in there….